People from all walks of life are donating money for the victims of the forest fire that ravaged Gangwon Province last week. 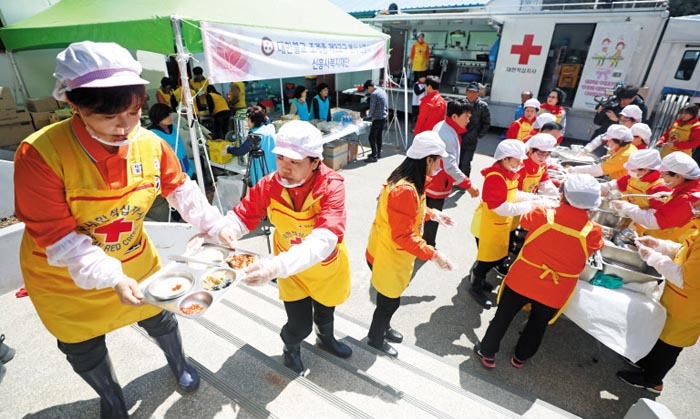 Disaster relief charity Hope Bridge had received W7.4 billion in donations by Sunday and the Community Chest of Korea W2.6 billion (US$1=W1,139). More than 140,000 people and businesses have donated money over the last three days. "We received lots of small donations from people around the country," a staffer at Hope Bridge said. Celebrities also pitched in. Singers IU and Psy donated W100 million each, actress So Yoo-jin W50 million, and actors Song Joong-ki, Jung Hae-in and Nam Joo-hyuk and singer Kim Hee-chul W30 million each. Fans also donated money in the name of their pop idols. Around 4,000 donations were made in the name of Daniel Kang and 900 in the name of boy superband Bangtan Boys. Hyundai donated W1 billion as well as bottled water, instant noodles and other supplies to Gangwon Province. The automaker also plans to send three trucks with washing machines, driers and power generators to the affected regions. Construction firm Booyoung Group is in talks with the Ministry of Land, Infrastructure and Transport to provide 224 apartments in its buildings in Gangwon Province to locals who have lost their homes to the blaze. Messaging app giant Kakao has collected W280 million for the victims so far, while CJ Group, Lotte Group, Eland and Korean Air donated relief supplies.